Yes…it’s true. This Juicy Bites post in front of you is for real. I am ACTUALLY posting a recipe! For those of you that have been eagerly awaiting more juicy bites, I apologize. No real excuses other than the fact that I am too darn lazy to take pictures of my food before it gets gobbled up! I won’t make any promises (I know myself too well), but I will try to keep posting more often than once a season! Speaking of seasons…even though it is spring, it feels like summer here in Southern California! It is HOT this week. Like 97 degrees HOT! Not our normal spring weather, or summer weather for that matter. Yes…we are spoiled here. I really don’t like this weather and I really don’t like cooking in this weather! Perfect time to try a recipe from my new cookbook “Giada’s Feel Good Food” by Giada De Laurentiis. My sweet hubby and boys bought it for me for Mother’s day. It is filled with light and healthy recipes like this one. A delicious dinner for a HOT day! This was the perfect dinner for a hot day. I love salads that are filling, hearty, and don’t leave you feeling like you didn’t get a real meal. This is one of those salads! My family loves just about anything with Asian flavors so this was a hit. Of course I had to make a couple of changes to the recipe (I seem to be incapable of following a recipe exactly). I added some grilled chicken for more protein and tinkered with the dressing a little. There is such a nice contrast of textures in this with the crunchy cabbage and the soba noodles that have just the right “chew” to them. I love soba noodles and the brand I buy from my chain grocery store is Hakubaku. Soba noodles are made with buckwheat flour which gives them a great texture. You can find gluten free soba noodles as well which is great if you have an gluten allergy or intolerance. They are made with all buckwheat flour and are a little darker in color but also delicious. 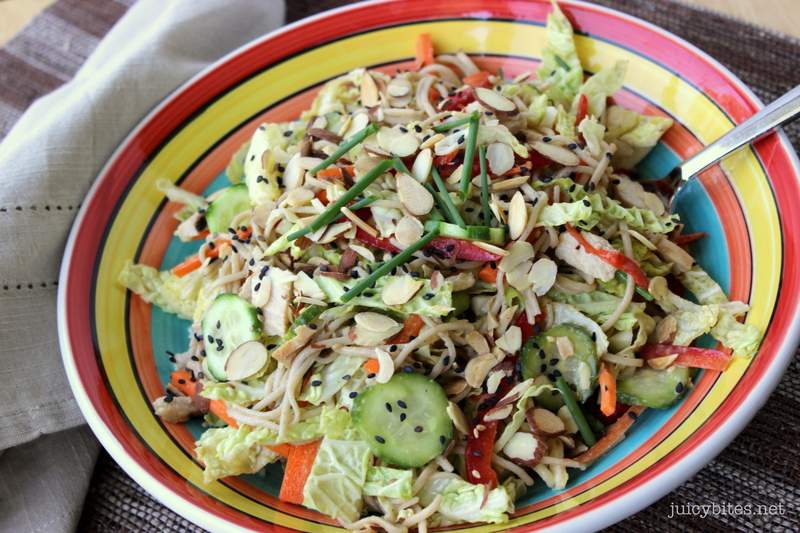 If you can’t find soba noodles, you can substitute any noodle you like in this salad. Whole wheat spaghetti works really well! For the chicken, I just had the hubs BBQ a couple of boneless, skinless chicken breasts. 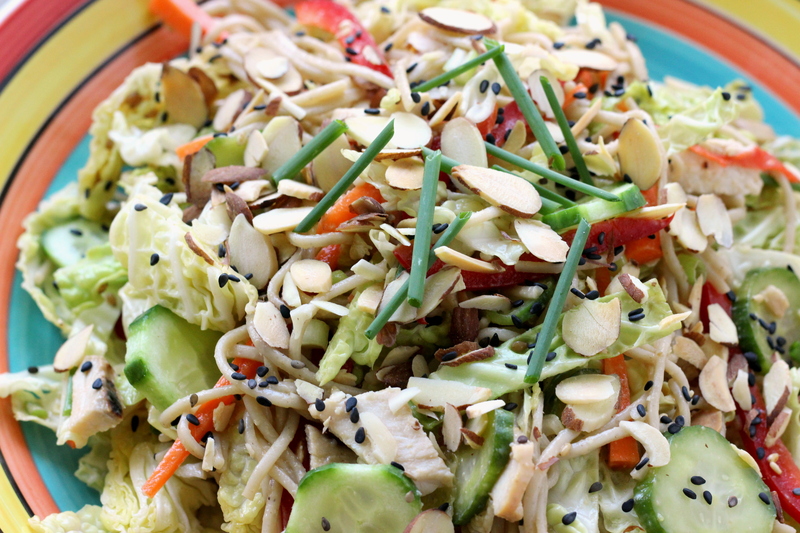 Left over chicken or rotisserie chicken would be great in this salad…the less cooking the better! All of the prep work (including cooking the noodles) can be done ahead of time so that you only need to assemble the ingredients when you are ready to eat. 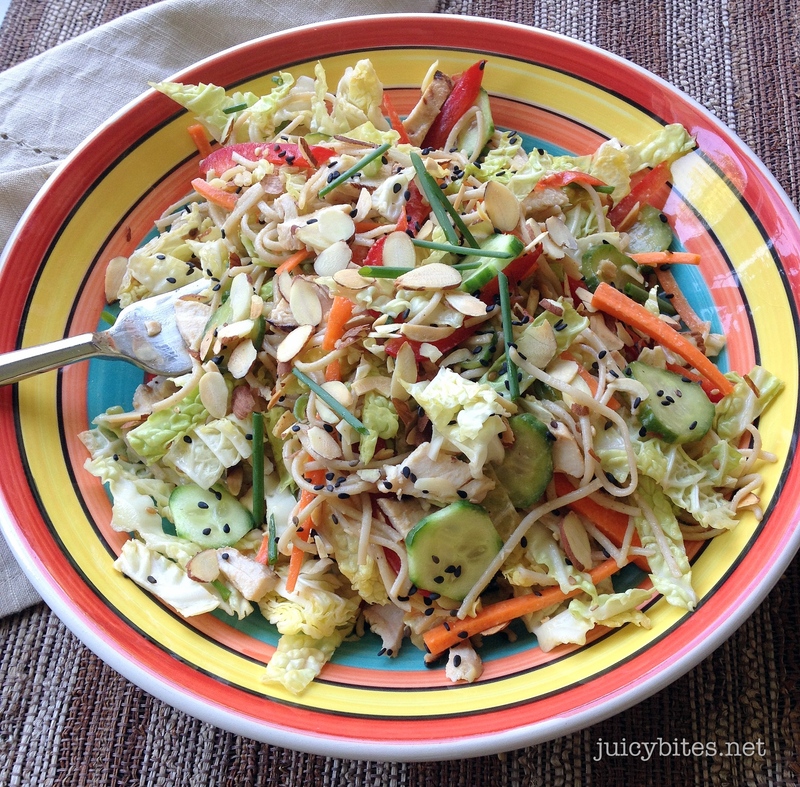 The creamy peanut dressing in this is soooo good! Oh yeah…that is another change I made. Giada uses almond butter and I went with peanut butter. I think both are great, but my kids prefer peanut butter. 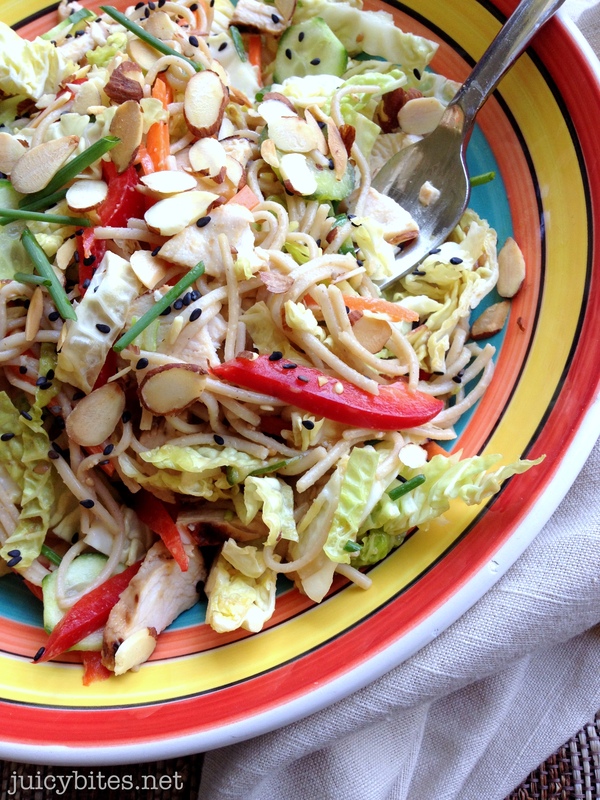 If peanut dressing is not your thing or there are peanut allergies in your family, any Asian dressing would be good. Heck, just a mix of soy sauce, rice vinegar, sesame oil and olive oil would be delish! Lucky for you all (and for me) there were left overs of this salad. That meant lunch for me today as well as a photo opportunity! I could hardly wait to get the pictures done so I could eat! Boil a large pot of salted water over high heat. Cook the noodles until tender but still firm to the bite, stirring occasionally, about 4 minutes. Rinse the noodles in cold water, drain well and place in a serving bowl. Pour the dressing over the noodles. Add the cabbage, green onions, bell peppers, carrots, cucumbers and almonds. Toss until all the ingredients are coated. Garnish with sesame seeds and serve.